The U.N. Security Council gave a resounding 15-0 endorsement Tuesday to a U.S. resolution backing the transfer of sovereignty to Iraq's new government 14 months after the fall of Saddam Hussein. President Bush predicted the measure would instill democracy and be a "catalyst for change" in the Middle East. The unanimous vote provided a boost for Mr. Bush a boost at the start of the Group of Eight economic summit in Georgia. "There were some that said we would never get it," Mr. Bush told reporters during a meeting with Japanese Prime Minister Junichiro Koizumi earlier Tuesday. "These nations understand that a free Iraq will serve as a catalyst for change in the broader Middle East, which is an important part of winning the war on terror," Mr. Bush said. But his administration lowered expectations of gaining other countries' military support — one of the original hopes behind the resolution. Four members of the G-8 summit — France, Germany, Russia and Canada — have said they won't send troops to take the burden off the 138,000 American soldiers and the 24,000 troops from coalition partners. Nevertheless, the adoption of the resolution will likely buy time for the new Iraqi government, boosting its international stature as it struggles to win acceptance and cope with a security crisis at home. French Foreign Minister Michel Barnier said many French ideas were incorporated in the final text though Paris would have liked a clearer definition of the relationship between the new Iraqi government and the U.S.-led force. "That doesn't stop us from a positive vote in New York to help in a constructive way find a positive exit to this tragedy," he told France-Inter radio. Iraqi President Ghazi al-Yawer, meeting in Washington with Powell, brushed off any suggestion that there might be disagreement between U.S. and Iraqi commanders. "We are working together," al-Yawer told reporters. "These people are in our country to help us." He added: "We have to think proactive. We cannot afford to be pessimistic." In Berlin, German Foreign Minister Joschka Fischer said he hopes "that now there will finally be a stabilization of the security situation in Iraq." 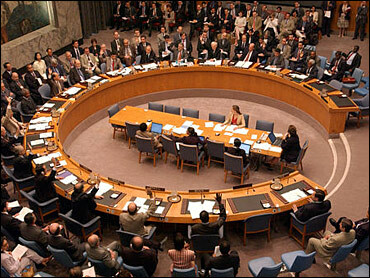 France and Germany had been among the sharpest critics in the Security Council of the U.S. decision to invade Iraq. On Tuesday, Barnier said that during the weeks of negotiations on the resolution "there was a real dialogue for the first time in this affair." "The Americans clearly understood, after months and months of military operations, that there was no way out by arms, by military operations in Iraq," the foreign minister said. "Washington understood that we have to get out of this tragedy by the high road." Many other council members who had objections to the early U.S.-British drafts also announced their support for the final resolution — the fifth since May 24. They included China, which had proposed major changes, and Algeria, the council's only Arab member, which argued for greater Iraqi control over its own military and major operations by the multinational force. "I hope that all council members will stand united," said China's U.N. Ambassador Wang Guangya. "This resolution will send several political messages, number one that the military occupation will come to an end. Secondly it will say that the Iraqi people will be granted full sovereignty. So I hope that this is a very good beginning for the Iraqis." The main compromise was an addition to the resolution summarizing Iraq's "security partnership" with U.S.-led forces, spelled out in an exchange of letters between Allawi and Powell.